The blade comes from the heavily exercised chuck and although having great flavor this is not a steak you want to bring home and just throw directly on the grill, the outcome will be a tough and chewy. Marinating with a tenderizing marinade is an option if you want to grill this steak outdoors, pan-sear or broil indoors, however braising or simmering is the best method to cook a blade, in liquid using low heat in a covered pan. The blade because of its fatty and unappealing appearance, sitting among other cuts in the meat counter is often overlooked, but this flavorful, economical cut can be very tasty and tender with the correct cooking method. 2. Heat 2 tablespoons of oil in a deep skillet to medium high if you wish to cook stove top. Another option is to heat a lightly oiled dutch oven, or stock pot, beginning on the stove on medium high and later transporting to the oven. 3. When the oil has heated up, about 3 minutes, add the steak and sear 2-3 minutes on each side until nicely browned. You can add slices of onion, garlic, peppers etc. if desired with the steak during the searing process. 5. Bring liquid to a boil on medium high heat, then quickly reduce to low heat to maintain a slow simmer. Don't boil, this will toughen rather than tenderize the beef. Keep lid on tight and don't lift unnecessarily, no need to turn steak and simmer 75-90 minutes until fork tender. If you are using a dutch oven or stockpot, preheat oven to 300 degrees, and once liquid is simmering, transfer pot with lid, to oven for 75-90 minutes until fork tender. 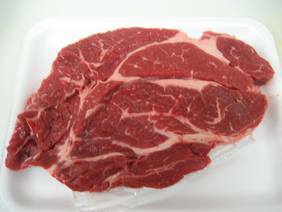 This is a great chuck steak recipe. The blade offers intense beef flavor and are cheap compared to cuts from the loin and rib, if cooked properly they can be just as good as the premium cuts.